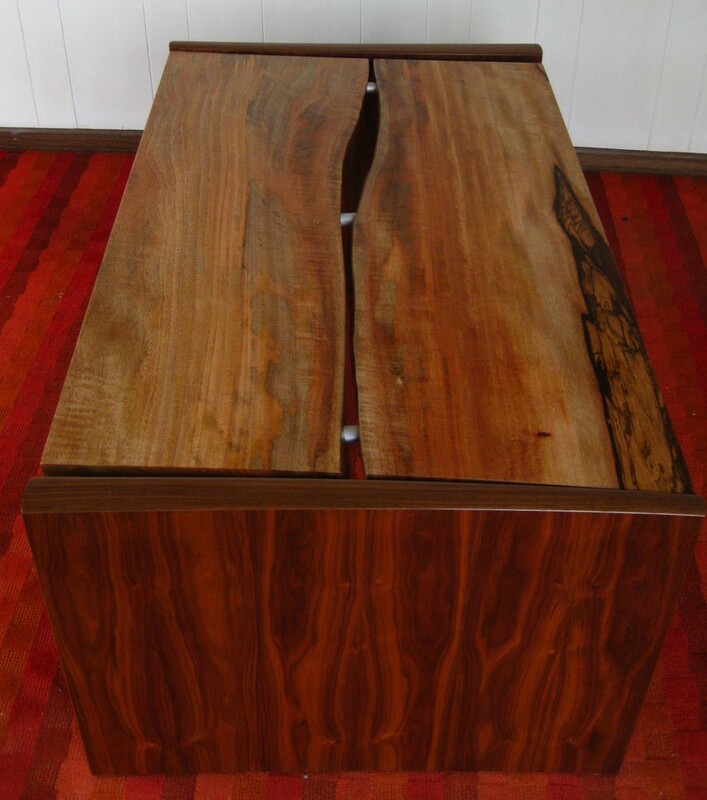 The Art of Fine Furniture Show opens this Saturday, June 22, 2013, 1:00-3:00pm, at the Winona County History Center. An opening celebration is scheduled with many of the 11 artists present to talk about their work. The show runs from June 22 through August 11, 2013. Jamie Schell, one of the artists and visionary of the show shared a few minutes talking about his experiences and what led him to become a fine art furniture maker. The museum bench, Mangifera et Juglandis, means Fruits and Nuts. The wood on the top is mango and the sides are walnut. 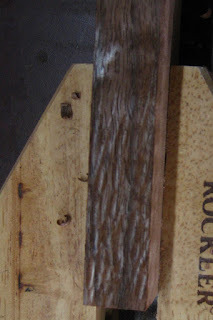 The natural curves in the wood are accentuated in Jamie's design. Jamie Schell grew up in Winona. Through work and travel, Jamie landed in Hawaii. 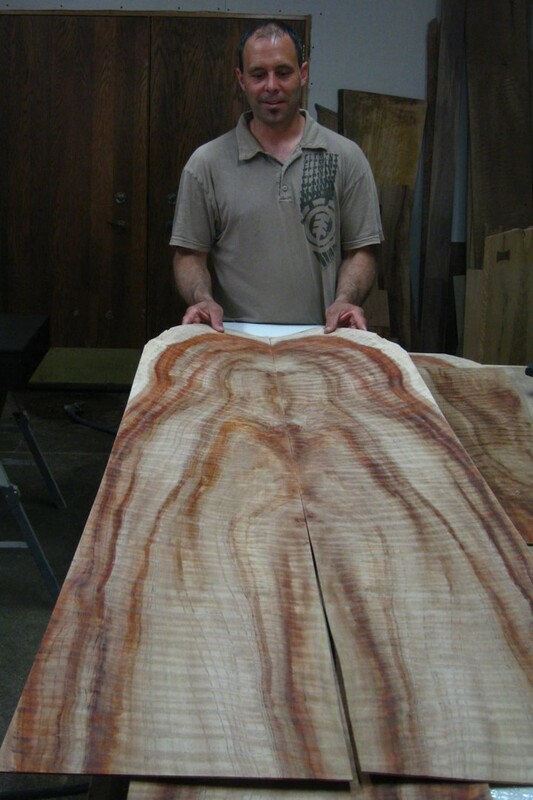 In Hawaii, he saw a new kind of woodworking. 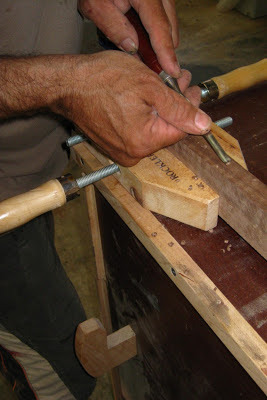 It had a beauty that drew him there and he wanted to learn more about woodworking. He decided to move to Hawaii and work with Leonard Guidroz. Guidroz was looking for help in his shop. Schell worked with him for three years under his mentorship. Then they decided to go into business together and formed G & S Woodworks, Inc. They worked in business together for four years. The physical beauty of Maui moves Jamie. Energetically it holds the beauty of the ocean. It's healthy feeling moves through spiritually, physically, and emotionally. He witnessed this energy in the many people able to make their living with their art including visual, performance, and healing arts. Jamie is inspired by the curves in nature—whether that is the curve of a wave or a blade of grass. Curves are ever changing—elliptical curves. “In his work, he plays with subtle curves to make subconscious connections with the natural world, such as the ever changing face of a wave, or a curving blade of grass. These forms and attention to detail can be discovered in his furniture and fine art. He is driven to explore various mediums – hoping to uncover their mysteries and have the courage to be guided by what he finds.” Quote from Jamie Schell website. Pathways I is a sculptural piece of cottonwood. 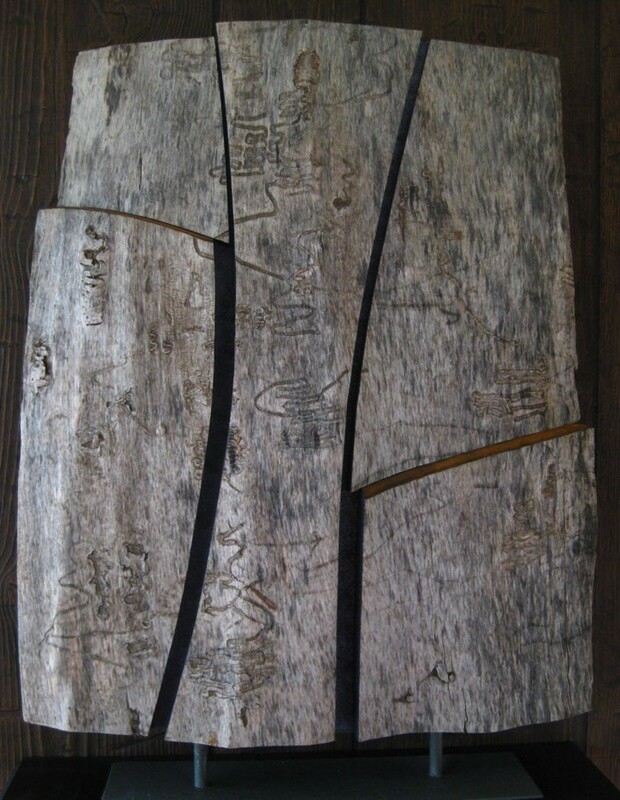 The indentations in the wood are worm hole marks. The sculpture is created with cut curved lines and iron paint, and blue metallic paint. The local tree was located at Money Creek near Houston, Minnesota. Woods he chooses: some harvested from Hawaii and some local in Minnesota. He likes to work with the person who is harvesting wood. 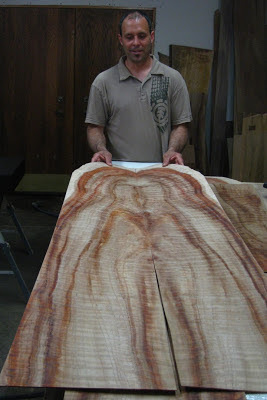 The pieces that he chooses are long thick slabs that run the length of the tree. Jamie looks at the wood for the discovery of what is there—and what the wood is saying needs to be created. He wants to honor the work of Mother Nature. 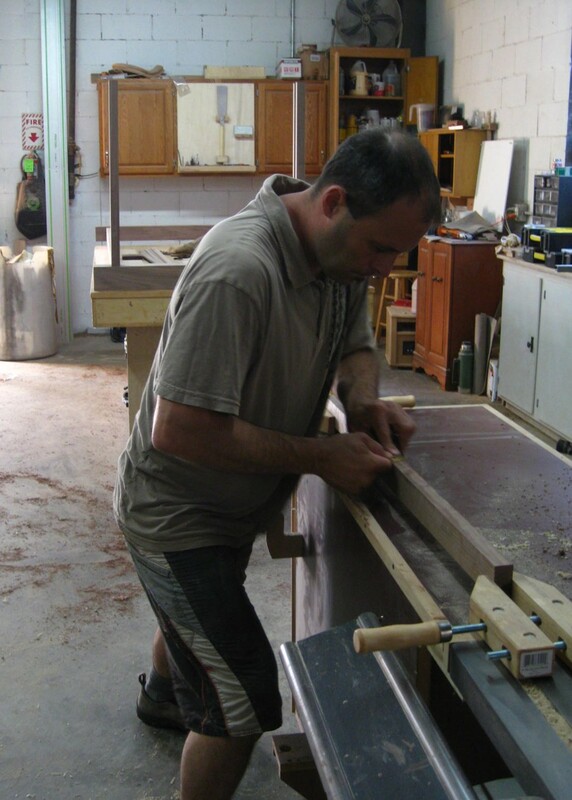 Jamie finds small producers who are willing to work with him to get the wood that inspires his art. Jamie says, “Trees have a story. An old tree may have been with a family over generations. It has seen a lot of life.” He wants to share the tree’s story through his work. He appreciates simple and well-crafted work. Jamie had the opportunity to look at the hand tools located at the Winona County History Center. He said that it was nice to see the marks that the chisel made. The tools were from a time when making things by hand was valued. It was considered an art form. The furniture was made by someone. That gave the piece of furniture a greater value. Wonderful post with heart and clarity!